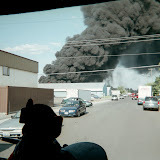 On, Wednesday April 11, 2012 the Spokane Fire Department responded at approximately 7:20 PM to 2717 North Altamont on a reported structure fire. The first crew on-scene reported heavy smoke and fire showing at the back of a vacant 1-story, wood-framed single family home. After further investigation the fire crew discovered a fire that had originated at or near the back porch of the residence had extended into the kitchen and attic of the structure. The firefighters aggressively attacked the fire from the interior while additional fire crews completed vertical ventilation, search and rescue, salvage and overhaul. The fire was brought under control within 20 minutes and there were no reported injuries to any civilians or firefighters. Seven fire companies with 25 firefighters responded to this fire and were on scene for approximately 2.5 hours. Fire damage was confined to the back porch, kitchen and attic with minor smoke damage through out the rest of the structure.